I’d like to change the name of this place to “Coughs and Barks”. 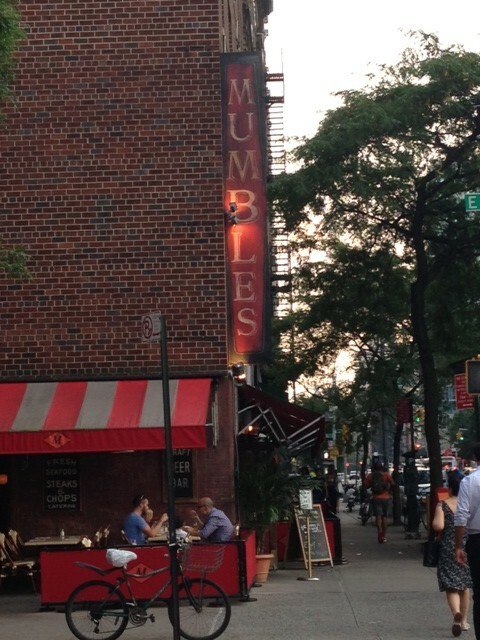 “Mumbles” is strange enough, but upon my visit here last week, we sat next to a woman with a hacking cough and a dog with the most annoying bark on earth. This has nothing to do with the restaurant or the food, but I had to vent and get it out there because I was ready to kick that dog in the face. And maybe the woman too. Sorry, I’m a New Yorker and I have little tolerance for annoying things. Moving on. I had a nice meal at Mumbles last week, despite the background noise. I’d like to go on record and say that the burger at Mumbles is DELICIOUS. I would stop right here and tell you to go in just for that. I’ll get to it, but trust me, it’s worth going back for and I plan on it. This restaurant sits on 3rd ave not far from Union Square, and while it’s pretty big, it’s still inviting and the staff is super friendly. Always a plus in my book. The menu is a mish mosh of things, so I was a little wary, because that to me says “we have no focus”. BUT, the food is pretty solid, and the Happy Hour is great: 7 Days a week, 5-7 pm, and then 9-closing, $5 well drinks, draft beer, and house wine. HOLLA! Don’t mind if I do. That’s a stellar deal for NYC. As for appetizers, there’s so much to choose from, so we went with the waitresses recommendations of the duck quesadilla and the fish tacos, while we picked the jamon croquettes ourselves. I have to say our instincts were right on point, as these were my favorite. So crispy on the outside, and oh so cheesy on the inside with little chunks of ham. 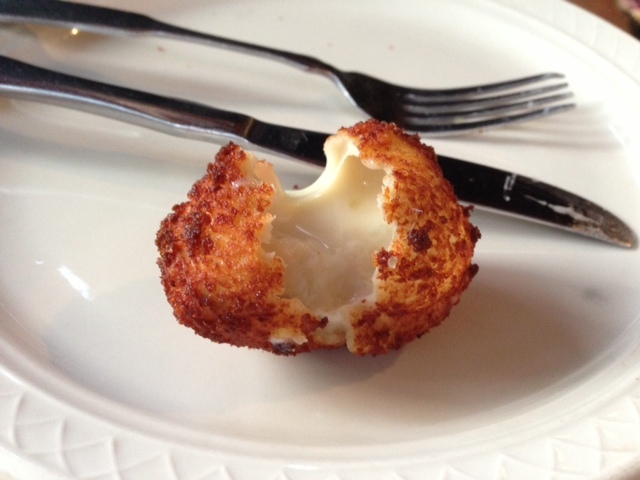 They serve them with this red pepper aioli for dipping and it is delicious. I used it on the burger too actually…awesome condiment, Mumbles! Lining up to dive into the aioli? 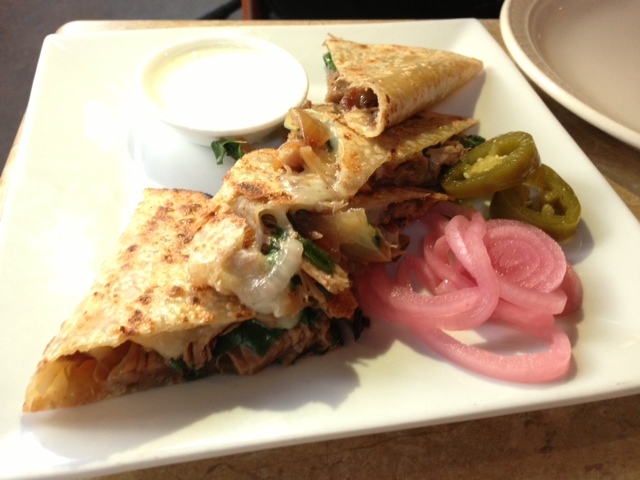 The duck quesadilla had ups and downs. The meat was a little overcooked, and it was WAY too greasy. I liked the bread/tortilla that they used, but it was soaked in oil. If the duck was a little more tender, I think I could have overlooked the greasiness, but it was just too much. Not bad, but not great. Needs tweaks. 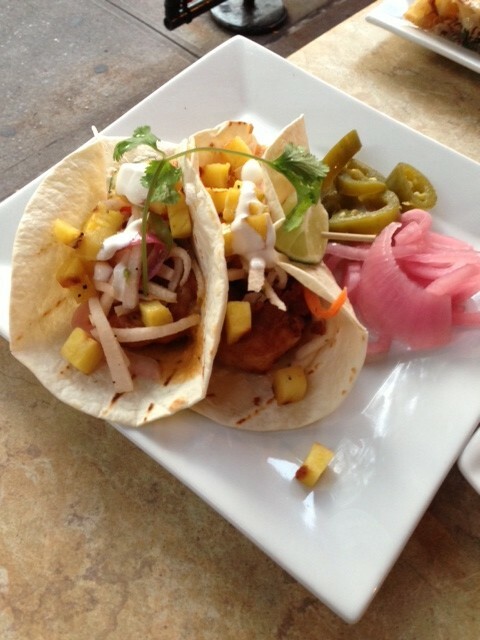 The fish tacos were good, but I can’t say that there was anything remarkable about them. I would order them again if I was really in the mood for fish tacos, but I would rather get another order of the jamon croquettes if I had my way. Decent fish tacos. That’s all. Now. THE BURGER. 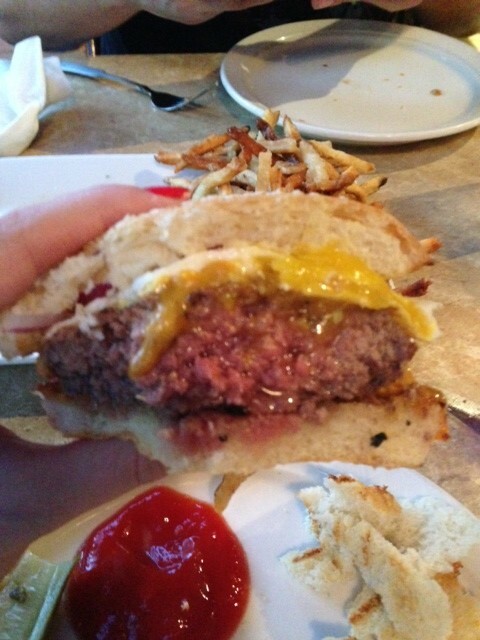 So Mumbles has special burgers every day of the week, and this happened to be the Tuesday burger which was topped with cheddar and a fried egg. That’s it. Normally I like to go all out and have bacon and the works on a burger but holy hell was this thing good. The meat itself was so tasty, medium, and the egg was cooked perfectly too – not such an easy feat, believe it or not. It oozes with yolk, meat juice, and cheese. 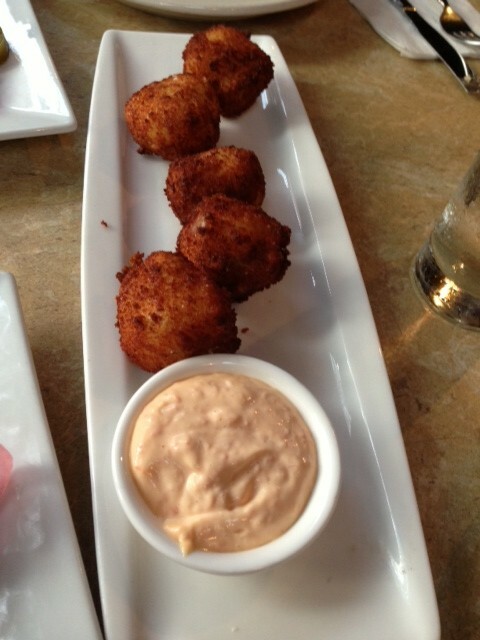 Like I said before, keep the red pepper aioli from the croquettes and dunk the burger in some of that. You will thank me later. The burger. It has arrived. Open WIDE. And be happy you did. 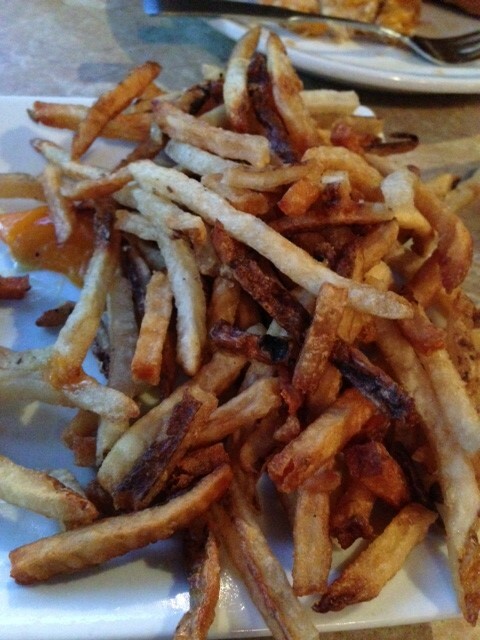 And let’s not forget the fries. Salty and well done – just the way I like em. This has “hangover meal” written all over it and in no way is that a bad thing. Ready for their close up..
After that burger, there was no room left for dessert. But frankly, this strikes me as a happy hour spot with good bar food anyway, so you’re probably better off without dessert. Not bad Mumbles, not bad at all. 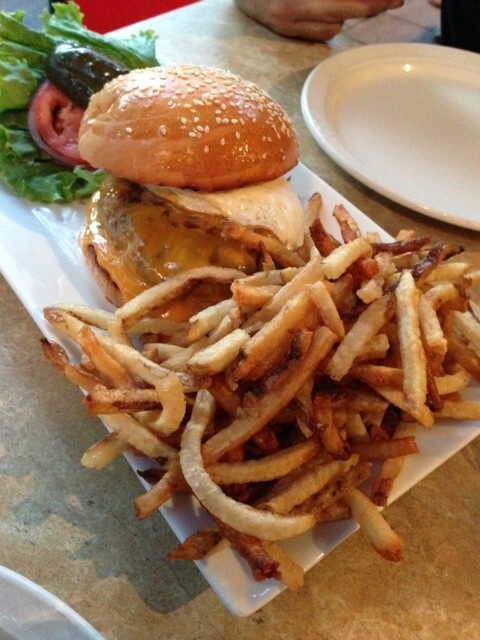 I’ll be back for that burger and Happy Hour…and fortunately there are many hours to choose from.